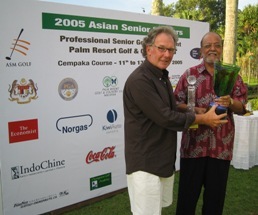 Stewart Ginn won the 2005 Asian Senior Masters tournament at Palm Resort Golf and Country Club today without ever having lost the lead. Ginn completed the tournament with a two-over par final round of 74 for a 54-hole total of 219. As predicted, his nearest challenger, Randall Vines managed to creep up the leader board to tie Ginn, at three-over par, when Ginn dropped a shot at the par-4 13th hole. Although Randall Vines eventually went on to complete his round with a one-over par 73, one better than Ginn’s final round of 74, his final-day performance was not quite enough, as he finished two shots behind Ginn’s final three-round total of 219. In his first appearance on the Asian Seniors Tour, Malaysia’s rising seniors star, M. Ramayah, finished with an impressive tenth position, with a 54-hole total of 227. The clash of the rising stars of the future saw no let up, as Feldman Tan from SICC proved that his performance throughout the week was no 'flash in the pan', completing an arduous week with another impressive amateur performance of a 77 on an extremely testing 7,065 yard course, to take the ASM Amateur Championship title by one shot from Ng Yau Loong from Royal Johor GC. Paul Lim from Palm Resort GCC took third place with an 81, followed by the very impressive 14-year old, Lion Goh from Laguna National GCC, who carded an 82. Click HERE to view the 2005 ASM @ Palm Resort results page. Tan Sri Elyas Omar, the Malaysian Commissioner of Sports closed the day by thanking all concerned and pledging the full support of the Ministry of Sports for the proposed 2006 Asian Seniors Tour event in Malaysia. 2003 ASM Amateur Championship with a fine score of 72. Choi Yoon Soo from Korea defeated Canadian John Irwin on the first hole of a sudden death play-off, sinking a 3 metre putt for a birdie on the par 5 18th to clinch the inaugural Asian Senior Masters. Tied for third were first round leader John Terry Gale from Australia, second round leader South African Tienie Britz and John Benda from the USA. They were followed in sixth place at 2 under by Mike Ferguson from Australia, Kuo Chie-Hsiung from ROC Taiwan and Mario Siodina from the Philippines. Asian Senior Master golf tournaments are International Senior Professional golf tournaments, preceded by up to 6 ASM Pro-Am events, where sponsors are able to spend quality time with and entertain their VIP customers, colleagues and business associates, in an exclusive environment, whilst on a corporate level enjoying the many on course branding opportunities, accompanying TV, print media publicity and PR opportunities and other benefits that are derived from their sponsorship participation in the event. 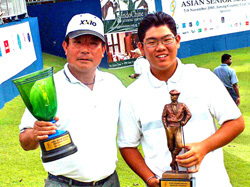 ASM tournaments involve up to 105 senior professional golfers, from all around the world, competing over 3 days for a minimum of US$ 100,000 in prize money, visit www.asm-malaysia.com/eventinformation.asp or click HERE for more information. US$ 250,000 prize purse event, making their ASM event the largest Senior Professional Tournament in Asia outside of Japan, this would require a US$ 400,000 sponsorship investment. Sponsoring a US$ 500,000 prize purse ASM event, would make their ASM event 3rd largest purse on the European Seniors Tour, and would require a US$ 700,000 sponsorship investment. Click HERE or visit www.asm-malaysia.com/newsdetails1.asp?NewsID=746 to view the wide range of Corporate Sponsorship packages available.